12 Again the Israelites did evil in the eyes of the Lord, and because they did this evil the Lord gave Eglon king of Moab power over Israel. 13 Getting the Ammonites and Amalekites to join him, Eglon came and attacked Israel, and they took possession of the City of Palms (Jerico). 14 The Israelites were subject to Eglon king of Moab for eighteen years. 20 Ehud then approached him while he was sitting alone in the upper room of his palace and said, “I have a message from God for you.” As the king rose from his seat, 21 Ehud reached with his left hand, drew the sword from his right thigh and plunged it into the king’s belly. 22 Even the handle sank in after the blade, and his bowels discharged. Ehud did not pull the sword out, and the fat closed in over it. 23 Then Ehud went out to the porch; he shut the doors of the upper room behind him and locked them. For nearly four hundred years following the invasion of Canaan in c.1406BC, Israel was a loose confederation of self-governing tribes. Far from being a strong and unified nation, the new inhabitants of Canaan consisted of scattered groups of tribal clans, often separated from each other by rival settlements of Canaanites, Amorites and Philistines who had occupied the area before the arrival of the Israelites. The ‘conquered’ land of Canaan remained dotted with ‘enemy’ strongholds such as Jebus (Jerusalem), Gezer and Megiddo, and the Philistine cities of Gaza, Gath, Ashkelon, Ashdod and Ekron were little more than a short march away. Frequently the rival groups clashed, and often the Philistines and Canaanites became dominant, demanding subservience from the Israelites. 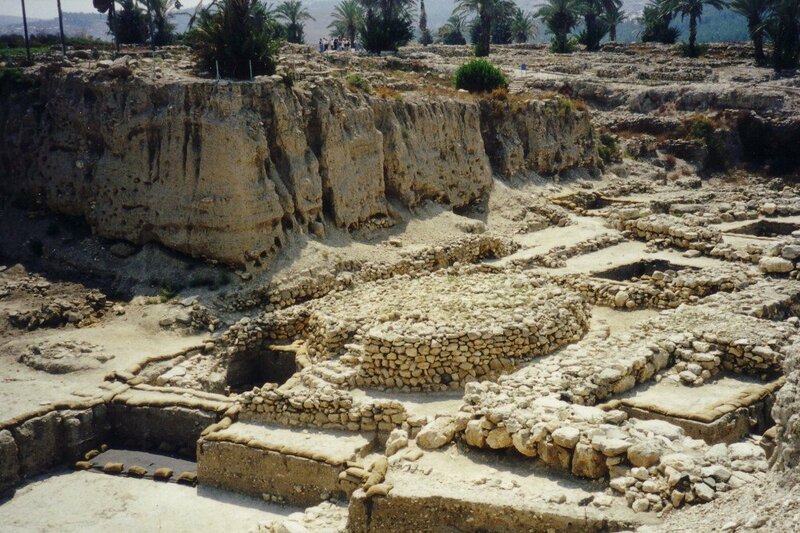 Throughout this period, intermarriage between the Israelites and their neighbours was common. The one thing uniting the Israelite tribes was their common worship of Yahweh, the God of Israel, and the Bible blames the failure of the Israelites to defeat their neighbours on intermarriage and the assimilation of foreign customs – including the worship of foreign gods. During particularly difficult times of subjection and hardship, God frequently raised up inspirational leaders who cajoled the Israelites into concerted action against their powerful neighbours. These leaders – strong characters such as Othniel, Deborah, Gideon, Jephthah and Samson – became known as the ‘judges’. The term is misleading, however, as while these leaders no doubt dispensed justice within their own local area, they had no jurisdiction over the other tribes of Israel. Even Samuel, the last and probably the most powerful of the ‘judges’, confined his ‘judge’s circuit’ to ‘sittings’ at Ramah, Bethel, Gilgal and Mizpah – all within a 15 mile / 24 km radius of his home in the central hill country of Ephraim, north of Jerusalem (see 1 Samuel 7:15-17).